Summer League â€“ July-September â€“ The SFBACC holds a summer league in Fremont on Thursdays, 7:30-9:45 pm. WineCountry Bonspiel, â€œThe Crushâ€ â€“ August 31- September 2 â€“ The first full-length bonspiel in California in decades is hosted by the WineCountry Curling club. The national champion and world bronze medal winning Todd Birr rink attend as special guests and win. Doug McNabb, an SFBACC founder and skip of the clubâ€™s 1978 menâ€™s national team, threw out the first rock. McNabbâ€™s 1978 teammates, Bob Kuhl and Jerome Larson were on had to cheer him on. 80 Members â€“ August â€“ The SFBACC reaches the 80 member mark for the first time in about three decades. Lyleâ€™s on CurlTV! â€“ October â€“ Lyle Sieg becomes the first SFBACC member to play a game on CurlTV. Sieg shoots second on Team Brian Wight in the â€œBilesky vs. Wightâ€ match in the Westcoast Curling Classic. - Fremont â€“ Saturdays, 9:45-11:45 pm. The SFBACC holds its first â€œsuper league,â€ a competitive league with no restrictions on team compositions. League winners: Tie between Team Ivy and Team Sieg. Team Ivy: Barry Ivy, Jon Nall, Eric Macauley, Bill Welch; Team Sieg: Lyle Sieg, Candace Siep, Brannon Wells, Nikki Larrabure. 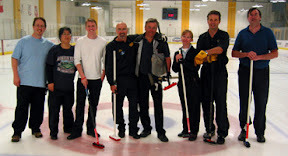 First Competitive Curling Meeting Held â€“ October â€“ For the first time in decades, California has enough clubs and curlers to need a state meeting to organize the selection of regional teams for competitive events. The SFBACC hosts this meeting, all California clubs are invited and curlers from the SFBACC and WCC attend. Many thanks to our outgoing board members, Dave Peck, Yvonne Reddy, Barry Ivy, Allan Barber and Gordon Mullin, for your service to the club! WCC Curler is Alternate for National Wheelchair Curling Team â€“ November â€“ WineCountry curler, Patrick McDonald, qualifies for a spot as an alternate on the National Wheelchair curling team. Open House â€“ December 22 - The club holds an open house in San Jose and has a great turnout of approximately 80 new people (about 10 of whom stay afterwards to play in the league.) Former SFBACC president and 1962 menâ€™s national competitor, Carroll McCune, joins in as well. Open House â€“ January 12 â€“ The club and Sharks Ice host the winter season open house, Saturday, January 12 from 9:15-11:45 pm in Fremont. Bylaws Revised â€“ January 9 â€“ The club passes revised bylaws (per the advice of our nonprofit lawyer) to assist with its 501(c)(3) application. Club Member in National Elite Qualifier and Challenge Round â€“ January â€“ Lyle Sieg plays for Team Brian Wight in the Menâ€™s National Qualifier in Schenectady, NY. Team Wight qualifies for the Challenge round in late January, but just misses the cut for Nationals. Club Nationals Playdowns - January 13 â€“ All three California teams fail to qualify during the MoPac Club Nationals playdowns. The Arizona and Oregon men are the winners. California teams: Team Coleman, Team Halpenny and WCC Team Markowski. MoPac Mixed Nationals Playdown in Seattle â€“ February 2-3 â€“ Two teams featuring SFBACC curlers participate in the MoPac Mixed Nationals playdowns: Team Sieg (Lyle Sieg, Candace Seip, Brannon Wells, Nikki Larrabure) and Team Ivy (Barry Ivy, Miyo Konno (WA), Jeff Tomlinson (OR), Gabrielle Coleman) Both fail to qualify, losing to Team Fred Maxie of AZ. Deaf Team Trials â€“ March 1 â€“ No tryout is held. Club members JoDee Dike-Johnson and Karen Officer are selected for the second time. All-Club Meeting â€“ March 11 â€“ The club holds an All-Club meeting. Sharks Ice hosts a pre-meeting reception and volunteer appreciation dinner. - San Jose, Tuesdays, 7:45-9:45 pm.